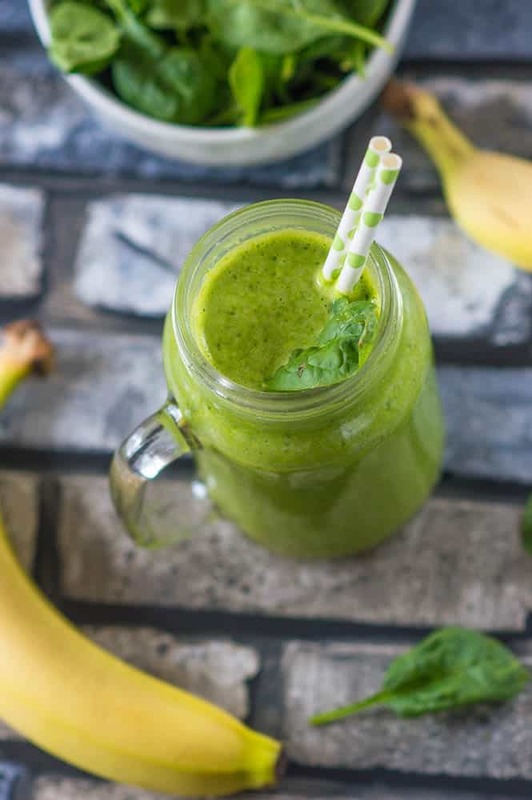 Basic green monster smoothie recipe – this no fuss smoothie consisting of leafy greens, coconut, cucumber and a banana for that sweet tooth is full of fibre. The green monster smoothie movement is in full force and by the look of things it’s here to stay. I don’t believe this is a bad thing, quite the contrary in fact. I myself hold ties to the green monster brigade, to the point where I can remember when I began so whip them up. 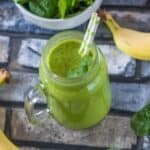 At the time I was watching Oprah Winfrey on The Doctor Oz Show, Dr Oz spoke about the concept behind the green smoothie and the many benefits to drinking a tall glass of greens. Back then I was a staunch health enthusiast but no where near as what I am right now. The next day I dropped the word “green monster smoothie” in a brief conversation with a fellow student, who looked at me like I had just asked her to collude with me in a bank robbery. The blank expression didn’t deter me though, I assumed she wasn’t familiar with this particular beverage (she too was a health foodie) and moved swiftly on. After class I made a mad dash to Sainsbury’s I knew exactly what fruits and vegetables I wanted to include and pursued a dash for my requirement. Thankfully the store stock all items; parsley, cucumber, lemon, lime, banana, apple, ginger, cinnamon and spinach. It was quite a vegetable medley, with the taste being very acquired. Many people loathe eating their greens so I wouldn’t expect them to make a bee line for smoothie like mine. Presently, I still drink green monster smoothies as part of my health regime. I thought it would be interesting to showcase a basic yet tasty green thickie. You can become really creative with these type of smoothies adding herbs, spices, nut milks, fruits and all types of veggies. However the foundation for a green smoothie remains the same which is green vegetables. 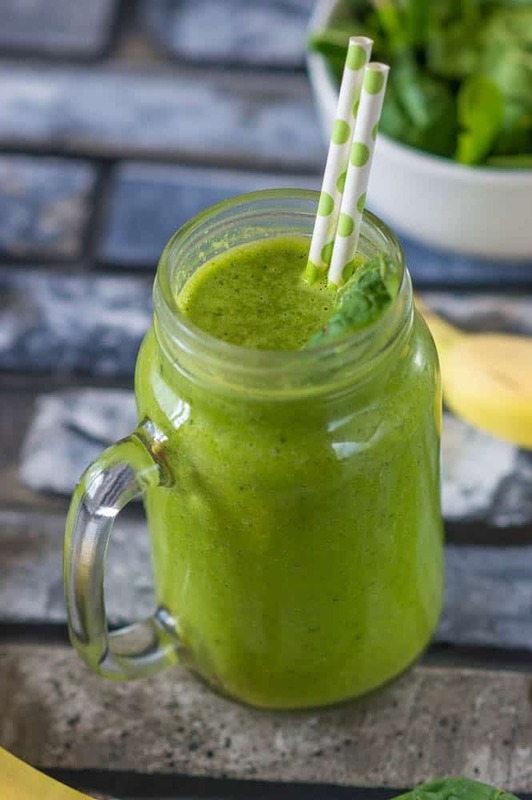 In terms of its health properties well many people drink green thickies to aid weightloss since it’s great for speeding up the metabolism whilst giving you a burst of energy. Also people with skin problems are finding that drinking a green thickie has help to strengthen the immune system. When the immune system is weak, our antibodies that ward of toxic substances is far more susceptible to creating adversity. By maintaining a healthy immune system, this can help to reduce an autoimmune attack which is responsible for ailments like lupus, eczema and psoriasis. These green boost smoothies can also help to stabilise our blood sugar levels, preventing that crash and burn, releasing glucose much slowly. This slow release in glucose explains why a veggie smoothie can keep us energised. What goes in a green monster smoothie? and so forth…….let list is endless!! Add all of the ingredients to a high speed blender and blitz until smooth. Thanks Shundara, I agree green monster smoothies are so good for us. I love green smoothies. I am making it my aim to have one every morning at the moment. I want to gulp this down!! Very nice and healthy recipe. Loving it..